Last week the 27th Australian soldier killed in Afghanistan was buried. Professor Hugh White, head of the ANU Strategic and Defence Studies Centre commented bitterly: “The mission has long since ceased to be about winning” and Liberal MP Russell Broadbent has expressed opposition to continued military involvement. 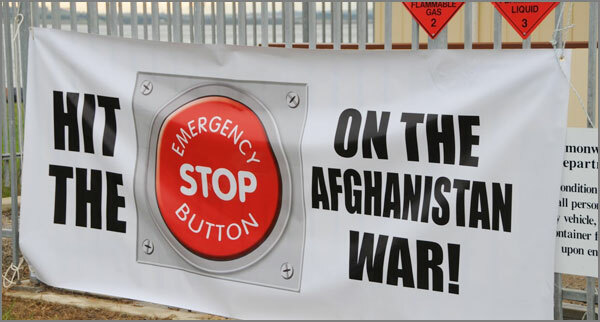 Last week Prime Minister Julia Gillard acknowledged growing opposition to Australia’s involvement in the Afghanistan war, but stated “… we know why we are there … and our mission is being accomplished. We are doing what we intended to do and we have a timeline for achieving our goal.” She failed, however, to define either the goal or the timeline for achieving it. A recent internet poll in Australia resulted in declarations of opposition to continued participation by most respondents, a trend echoed on local talk-back radio. In the US, the proportion of opinion poll respondents expressing opposition has rarely fallen below 50 percent. In one poll 74 percent supported a phased withdrawal of US troops and in a highly disturbing trend for the White House 39 percent said the US should get out immediately. As justification for the invasion, most US respondents cited the combating of terrorism and the defeat of Al-Qaeda. That’s not surprising. Securing an overland route to the Caspian Sea and its vast oil supplies for western interests, or contributing to a military encirclement of China are never mentioned as primary motivation for the invasion in the mass media. However, respondents also cited the assassination of Osama bin Laden as justification for a withdrawal. The US invaded Afghanistan in the aftermath of the September 11 attacks in 2001, on the deliberately superficial pretext that bin Laden was there, and it was necessary to capture or kill him because he was the leader of Al Qaeda, the organisation the Bush administration blamed for the attacks. That tactic accounts for the wild public rejoicing of many US citizens after his death: they have now logically concluded that since he’s gone the war in Afghanistan can end. But the White House has revealed that bin Laden’s assassination was planned a year in advance, which raises the possibility that the US knew of his whereabouts for even longer, perhaps since the September 11 attacks, and that they deliberately left him alone. They might have even been in collusion with him. After all, the Clinton administration named him public enemy No. 1, but in 1998 declined an offer from the Sudanese government for his deportation to the US, and the Bush regime flew his family out of the US the day after the September 11 attacks, in the only plane flying into or out of the country. The US certainly used demonic images of bin Laden to foster public support for the invasion. So why was he killed? The answer may well be because economic self-interest is now outweighing military priorities. US President Obama has called for a US$400 billion cut in military expenditure, in order to reduce the US$4.3 trillion US national debt. In fact, the US is teetering on the edge of an economic abyss. Its government lives in constant fear that a foreign power will establish an international “basket of currencies” trading regime, as the former government of Iraq was about to do, prior to its invasion by the US and its allies. The use of the greenback as the international trading currency has cushioned the US against the potentially fearful impacts of its national debt. The dumping of the greenback in favour of a multi-currency regime would inflict massive damage on the economy of the US, and would deal a mortal blow to its position as the globally dominant power. Acutely aware of mounting public opposition to the war, Obama has declared that the 100,000 US troops will leave Afghanistan by 2014, in a phased withdrawal starting next month. But procrastination is the name of the game. Carl Levin, Democrat member of the Senate Armed Services committee has called for an immediate withdrawal of 15,000 troops, but former Presidential republican candidate John McCain has nominated a figure of only 3,000. Moreover, current US Defence Secretary Robert Gates has stated his opposition to a withdrawal of troops if it would threaten the safety of remaining forces, and his incoming successor Leon Panetta has called for a “condition-based” withdrawal. Taken together, both statements imply that some US forces should remain in Afghanistan indefinitely, just as in Iraq, where 47,000 US troops are still stationed. The Pentagon warlords are certainly not impressed with the economic arguments for withdrawal. They’re also frightened that their allies will take the US government at its word and immediately withdraw their own troops, leaving the US as the sole remaining force. Last week Gates thundered: “I assure my fellow ministers that there will be no rush to the exits on our part – and we expect the same from our allies!”. Australia has to bring its troops home, not just because of the declining power of the US but because we should never have been involved in the first place. We have been complicit in an aggressive multinational invasion that has wrought terrible damage on Afghanistan and has resulted in the installation of yet another corrupt, despotic government. Just as in the Vietnam War, our young soldiers are dying in a bloody, totally unjustified conflict with no end in sight (despite claims to the contrary by conservative politicians), to fulfil the imperial ambitions of the United States. Afghan citizens, including combatants and civilians, have died in far greater numbers than the troops of the western armies. The Afghan people did not ask us to invade their country. They had just as much right to live in peace as our citizens. Because of its role in the invading force, Australia should offer the people of Afghanistan post-war reparations. And we should be mourning the Afghan dead as well as our own. As poet John Donne observed: “… never send to know for whom the bell tolls; it tolls for thee”.